Early miles. 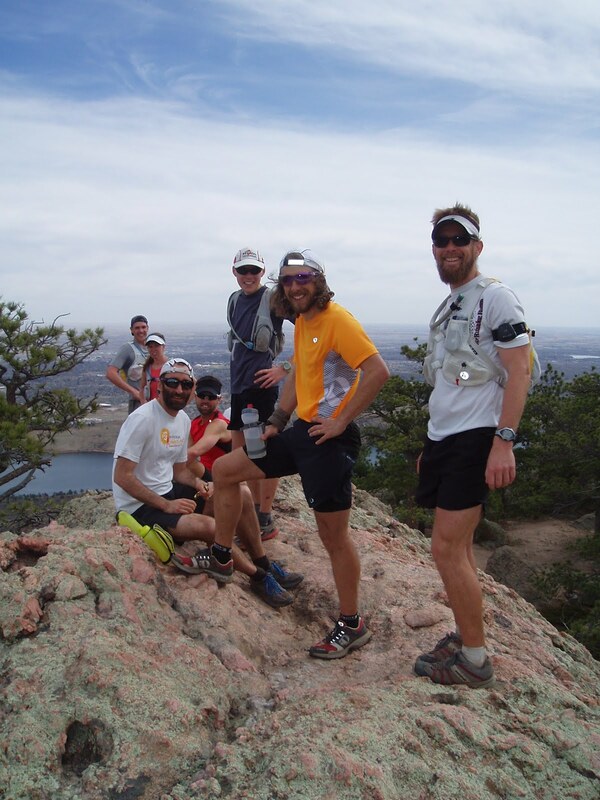 Tiernan (in white shirt) looking directly at Horsetooth Rock. Stevenson, Tiernan, Pedatella. Horsetooth Rock summit. 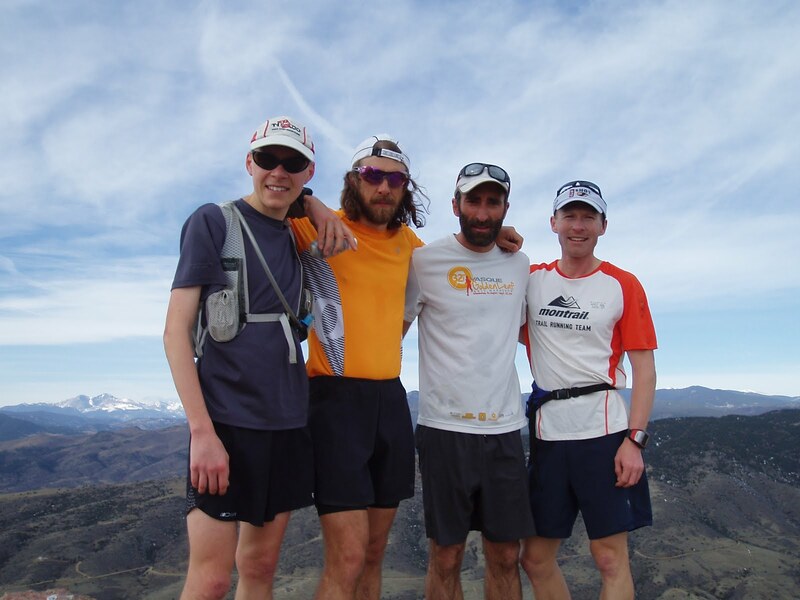 Pedatella, Clark, Tiernan, Burch. Horsetooth Rock summit. Tiernan, Pedatella, Stevenson, Kosick. Arthur's Rock summit. Arthur's Rock view. 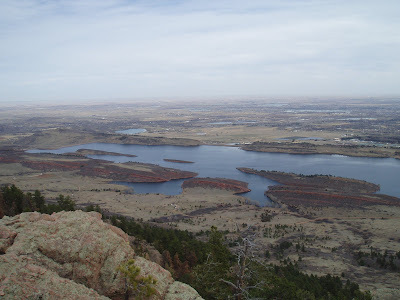 Horsetooth Reservoir below. The finish line. 5 men. 37 miles later. Wow! I am a happy man with the time change and the BEAUTIFUL weather that has sun kissed the Front Range. It has been a huge gift having the extra hour of light and the warmth to run in shorts and a shirt. Ladies and gentlemen Spring Fever has arrived! I've also noticed that people in general have been more apt to smile, say hello, and overall are friendlier on the trails and in town. The above changes have prompted me to make a few changes of my own and ponder a few others. 1. The 70 degree days have put a solid dent in the snowpack which made for treachery free running on Round Mtn this past Friday. The extra sun after a day at work is calling me to run some of the local peaks that are a little further to get to...and being able to finish without a headlamp...priceless. 2. With the extra warmth I've pondered running shirtless on multiple occasions. However, with the complexion of a surrender flag I have done just that. 3. For those that know me and my complexion well I am proud to say that I have already applied sunscreen twice this past week and doing so crushed my numbers from last year. 4. I'm learning more from nature and applying some of these principles to my life. Snakes shed their skins. Other mammals shed their fur. With the changing of the seasons coming quickly I got out the clippers and took off my winter coat. This is crucial for the heat that will come at States and the hours it could save. 5. It's just great to be outside when it's nice. Dinners on the porch. Riding the bike. Walking the town. Driving with the windows down and the volume turned up. The smell of BBQ's. Awesomeness. So yesterday I had an awesome run at Lory. One of those runs where you could run effortlessly all day. I felt content doing one of the activities I love in a familiar place that has cultivated that passion. The run was 16 miles. 16 miles for the soul and 16 miles knowing that I would be running at least 35 the next morning. Usher in Sunday morning and the FCTR version of March Madness. 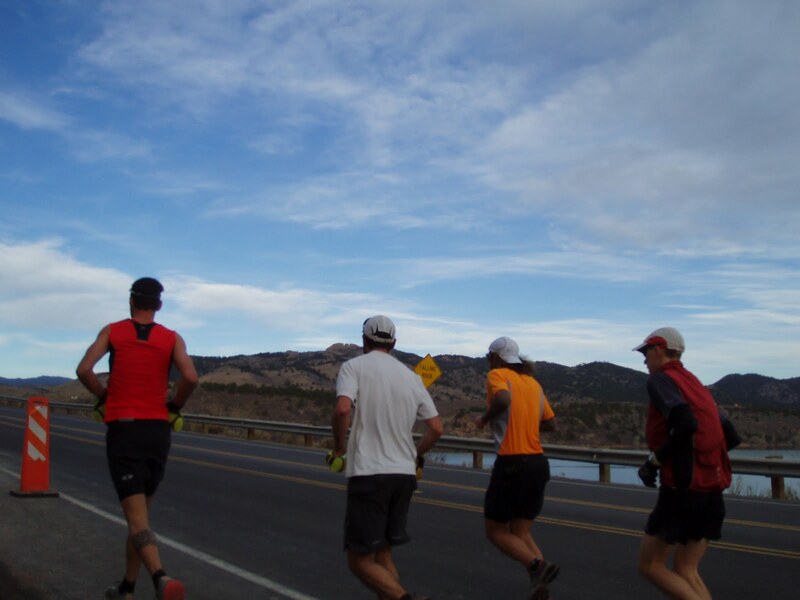 The run circumnavigates Horsetooth Reservoir primarily on dirt. 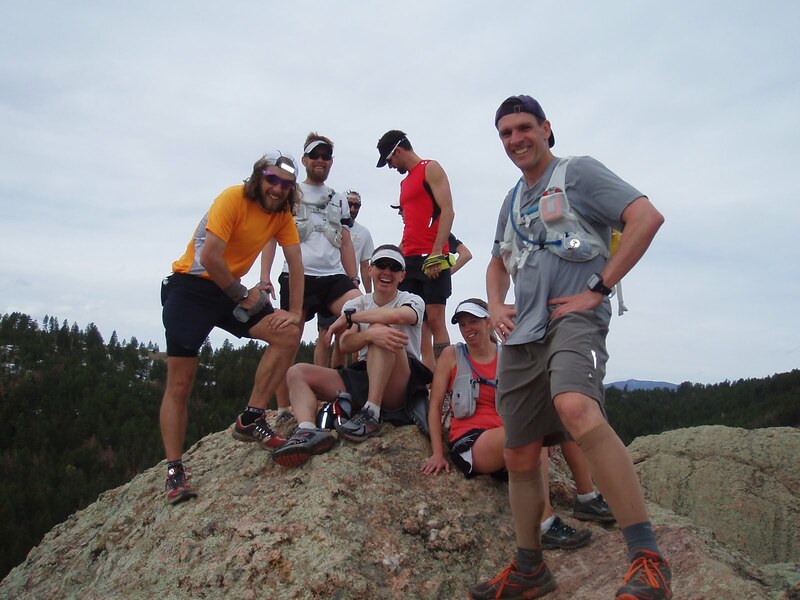 Runners choose either the 23 or the 35 mile option that adds mileage summiting Horsetooth Rock and Arthur's Rock. Pick your start time and enjoy a great group long run for the day followed by a BBQ hosted at Alex May's house (and a huge THANK YOU to Alex and fam for their hospitality). 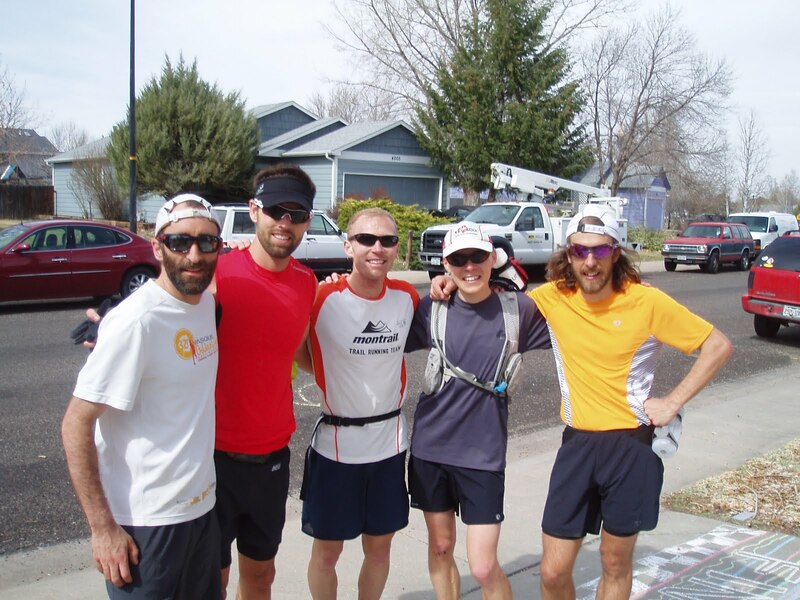 Around 7:45 I embarked for the day's journey with Clark, Tiernan, Pedatella, and Kosick. It amazes me time after time how much easier and enjoyable it is to run long distances with a group. 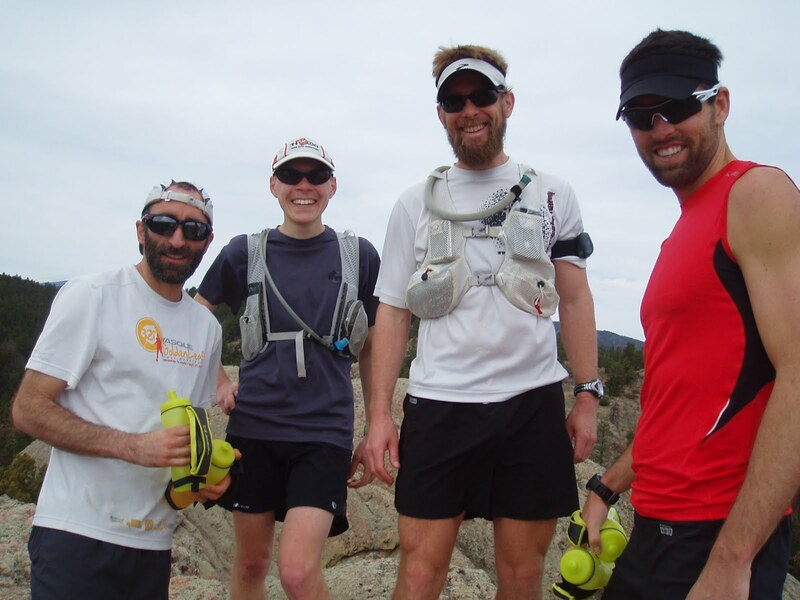 The collective energy makes the miles and minutes tick by so much faster. All of a sudden we were back at Alex's house! Stats: 37.1 miles with a Westridge bonus. 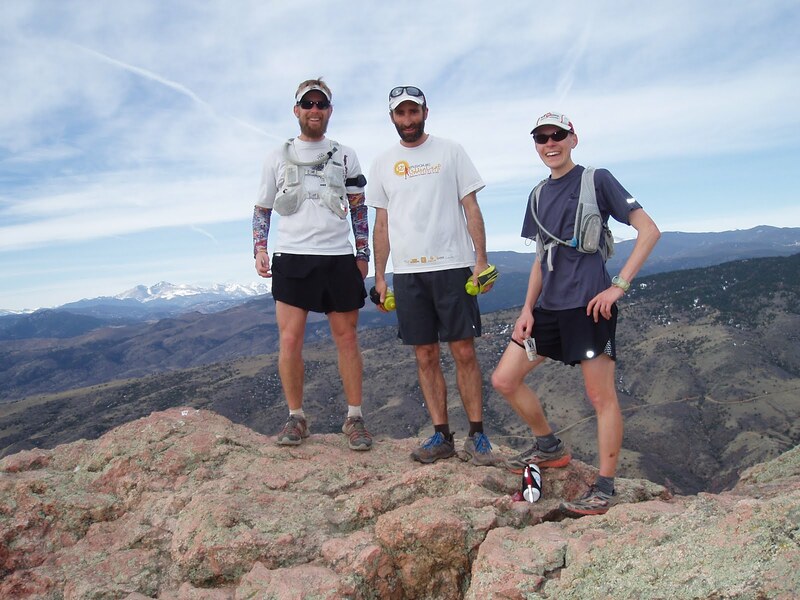 5:52 run time, 9:30/mile, 7000+ vertical gain, 700 calories, 2 summits, 1 big reservoir run around. On another note...my first two weekend trainings with the Guard have been great! It has been positive to get out of my comfort zone and experience military culture firsthand. It's refreshing having a time in my life to enter a new world and all the new experiences that come with it. I'm really looking forward to challenging myself in new ways and experiencing so many things that can only be experienced if you choose to serve. Last weekend I got to battle with pugil sticks. I played dodgeball for extra PT. I have needed a job where I can use my mind and my body. The Guard helps tremendously with that need. How many employers want their employees to be fit and actively help them do that? It's encouraging having an employer that expects me to sweat and stay in shape. So far I've been able to do 49 pushups and 41 situps in a minute. I'm also working on improving my mile PR with no warm-up which currently stands at 5:20. New challenges. Good stuff. Great stuff, sorry to have missed it. Certainly is nice to have the weather and conditions cooperating -- hope to do some runs together before States. Very happy to hear your enjoyment with the new job, too, cheers! Mike- Clark gave us some updates on the run today- sounds like things are coming together nicely for your run at States- keep up the good work! Wait - you pull both 49 pushups and 41 situps in one minute? Or are each of those a minute? So bummed I missed out yesterday. Hope all is well buddy. Hopefully we'll connect soon. Fun times, senor. Thanks for the company. GZ- One minute pushups, one minute situps. DBOW- I'll be in Glenwood beginning of April- Zeke knows- we'll all have to get in some miles together. Nick and Nick- always a pleasure!